Don’t waste your money trying Sugar Balance by ‘Dr David Pearson’ because it is a scam! This product is targeted at those with type 2 diabetes so if you’re in this group, pay attention to this review because it will save your time and money. So let’s begin, shall we? The Sugar Balance website domain was created in December 2015, but the product itself was launched somewhere around October 2018. Its so-called creator Dr Pearson claims that he has discovered the ‘miracle ingredients’ that will treat ‘the root cause of blood sugar’. He goes on to claim that the cause of insulin resistance is NOT a problematic pancreas, but a ‘fatty liver’. Pearson poses as a medical doctor gone rogue, who is apparently ‘biting the hands of those that fed him for over 30 years’ by bringing us this ‘miracle’ cure and revealing to us ‘the devastating and dangerous secrets the medical industry is terrified you’ll find out.’ He also claims that he’s going to show you how to restore your blood sugar to normal levels without having to make any lifestyle changes or taking insulin shots and other prescription meds. Pearson claims that his Sugar Balance product is suitable for anyone with type 2 diabetes and it doesn’t matter how severe or complicated your condition is. Interesting. Pearson claims that each capsule of Sugar Balance contains 800mg of a combination of these ingredients. However, he did not even bother to show us the label containing information about these ingredients so that we can see for ourselves the amount of each ingredient used in the pill. Apparently he thinks that rattling off several ‘studies’ proving the benefits of these ingredients to those battling diabetes will substitute for the product composition facts. Wrong! Alright. Let’s just cut to the chase. 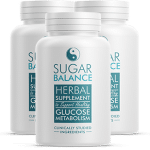 Why is Sugar Balance a scam? Dr David Pearson describes himself as a 54-year old former epidemiologist with 27 years of experience who has researched ‘every diabetic condition under the sun.’ He also calls himself the ‘crooked medical industry’s enemy number 1’ because for the past two years he has supposedly stopped ‘sucking at the teat’ of the medical industry and now is exposing their diabolic schemes to pile you with dangerous drugs. Well that’s strange, because if it were true, he should be in the news (after all, the media has become notorious recently for going after people and ruining their careers). At least, he should be turning some heads on social media or be active on at least one social media platform. But no, there is neither an official sign of Dr Pearson on social media, nor any mention of his medical activism in the news. Worse still, there is no way of knowing where he worked for 27 years as an epidemiologist so that at least we can confirm that he’s real. The photo passed off as him doesn’t look real to me … I think that it is a stock photo that is no longer available from its original source. I’m not sure about this though so take a look at the photo below and see whether you can trace where it was taken from. Either way, Dr Pearson is unverifiable. 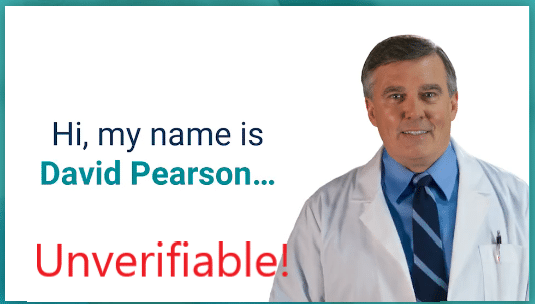 If you watch the video presentation, you’ll notice that Dr Pearson also calls himself the ‘chief medical researcher’ of Proven Health, the company who supposedly owns and operates the facility where Sugar Balance is manufactured. I tried searching for information about this company … and all my efforts yielded nothing. No name, no address (he mentioned Sugar Balance is made in the USA though), no phone number. To make matters worse, the Terms and Conditions doesn’t even mention the company’s name. Instead, we’re told that Sugar Balance is owned by a company called Nature’s Formulas, which is based in Barbados. Something is fishy here, don’t you think? Really? And that’s not just the end of it. The Terms and Conditions also state that, by using Sugar Balance, you waive your legal right to bring a class action lawsuit against them. So, not only are we dealing with a company giving us false information about its identity and location, but you can’t even sue them if anything goes wrong and justice is needed to address the situation. Goes to show you the kind of scam we’re dealing with, don’t you think? ‘Tosin Ogunseye’ is a stock photo available for purchase at Shutterstock. So as you can see, we just can’t trust Dr Pearson’s claim that Sugar Balance works because his testimonials are stock photos anyone can buy for decoration and illustration purposes. If you’ve made this far in this review then you wouldn’t be surprised by this finding. But I decided to list it just to emphasize how scammy the presentation of Sugar Balance is. I mean, what’s up with the bashing of the medical and pharmaceutical industry, and what’s up with that countdown timer before the call-to-action button? Frankly speaking, stay away from any product that bashes the medical and/or the pharmaceutical industry as part of their marketing strategy. Most of the time, they are scams … and one of the worst things you can do to yourself is to deal with hypocrites! Like I mentioned earlier, Dr Pearson claims that fatty liver is the true, ‘number 1’ root cause of type 2 diabetes, not pancreas dysfunction. He goes on to claim that blood sugar level maintenance is the function of the liver, ‘specifically the fatty liver.’ He then finishes by saying that Sugar Balance works by specifically targeting the fat in the liver and eliminating it, which will then automagically reverse insulin resistance and consequently, reduce your blood sugar levels. Pearson attempts to authenticate his claim by citing several studies and quoting researchers out of context but at this point, given the amount of scam evidence I’ve already uncovered about this product, I won’t bother myself looking into these studies to expose his lies. However, I will say that he’s laughably wrong by claiming that the ‘number 1’ cause of increased blood sugar in type 2 diabetes is a fatty liver. This is because he clearly doesn’t know that fatty liver is a consequence of insulin resistance, NOT the cause. Yes, morbid obesity is the primary cause of fatty liver and we already know that obesity leads to insulin resistance. But ask yourself: What about the patients who only gained weight because of type 2 diabetes? Was their insulin resistance caused by a fatty liver? Final Conclusion: DON’T BUY Sugar Balance. It is A SCAM! Forget about that empty promise of Sugar Balance having a ’60 day money back guarantee’ because you’ll definitely not get your money back. It’s better to file a credit card dispute with your bank or contact Buygoods, the retailer, for your money back. Please check my Whitelist for alternatives to Sugar Balance. They are all legit programs that will help you lower your sugar levels and reverse your insulin resistance problem. Unlike this scam, they all honor their moneyback guarantee so rest assured that you’ll get your money back if you find that their program isn’t suitable for you. Please feel free to use the comments section above if you have any contributions to make. Thank you!